Steak lovers would have probably heard of the divine signature from Lawry’s The Prime Rib, but few know that they’ve been around for 19 years now! Lawry’s The Prime Rib first opened its doors for the first time back in 15 June 1938 at Beverly Hills, and the outlet at Mandarin Gallery was actually their first overseas franchise. Enclosed by full-length windows, the place is brightly lit with sunlight filtering in. 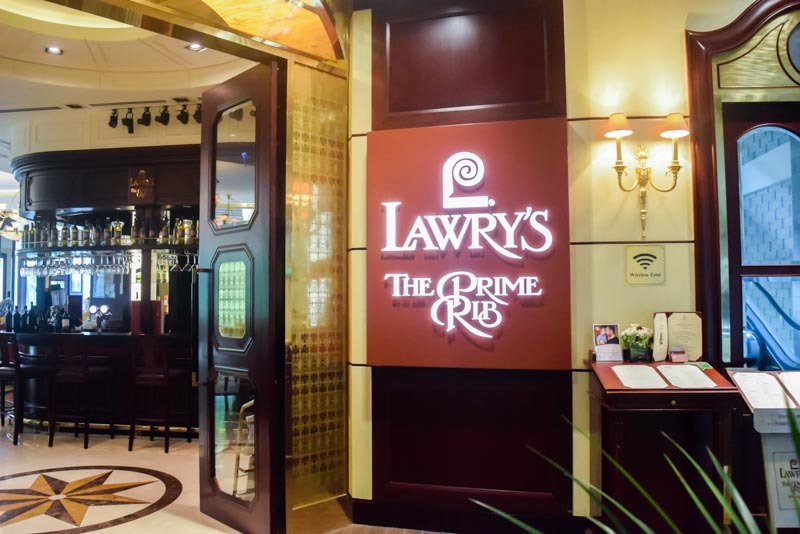 To celebrate their 19th year here, Lawry’s The Prime Rib Singapore has specially curated a four-course 19th Anniversary Menu ($118++ per pax, $188++ per 2 pax) and I went down to have a taste! The meal started off with the restaurant’s classic The Famous Original Spinning Bowl Salad and for the longest time, I was wondering why it was so called. But then I got an epiphany when they wheeled the salad bowl in. Literally spun over a bed of ice, the salad is also served with a chilled fork to ensure that everything on the plate stays chilly even after being served, as it is best enjoyed cold. The salad was followed by the Appetizer Samplers, which was a trio of Foie Gras with Thyme Gelee, Hokkaido Scallop with Tobiko and fresh Mango Salsa, and Chicken Gyoza with Wasabi Mayonnaise (pictured from left to right). This was a sort of surf and turf, as I like to call it, with elements from both land and sea. Following the appetisers, guests get to choose between a selection of three different mains. Not to be missed is the USDA Roasted Prime Rib of Beef – The Anniversary Cut. The steak is best enjoyed with the Yorkshire Pudding and horseradish that comes on the side. We watched the head chef, Sherwin Sim, carve the beef slices right before us which was a treat for both our eyes and stomachs. If beef isn’t your thing, you can also opt for the Baked Herb Crusted Salmon with Mediterranean Vegetables and Idaho Mash. Another popular favourite is the Truffle Rosemary Lamb Rack, oven-baked to juicy perfection. It also comes with a side of mushroom sauce to be poured over your lamb. Diners can choose to wrap up the meal with one of two choices, and the Sea Salt Caramel Pecan Mousse Cake with Häagen-Dazs Vanilla Bean Ice Cream is one of them. But if you’re looking for something more refreshing to cleanse your palate, then the Lemon Meringue Cake with Yuzu Ice Cream is the ideal choice. Plated to perfection, both desserts sound like a pretty sweet way to conclude the indulgent course. Ever since Chef Sherwin’s takeover, the restaurant has seen more Asian influences in their cuisine as opposed to their otherwise western origin.